Smiley Holly Willoughby is the nation’s sweetheart on This Morning with her cute little tea dresses and inoffensive manner. But last night at Jonathan Ross’ annual Halloween bash, the 31-year-old couldn’t have looked further from her normally gorgeous and flawless self. Hiding her trademark blonde locks underneath a black wig, Holly popped in some scary red contact lenses and applied incredible face make-up worthy of a Hollywood movie. The Celebrity Juice panellist looked terrifying - it seemed as if her face had been unzipped revealing red raw skin and a half-destroyed nose underneath. 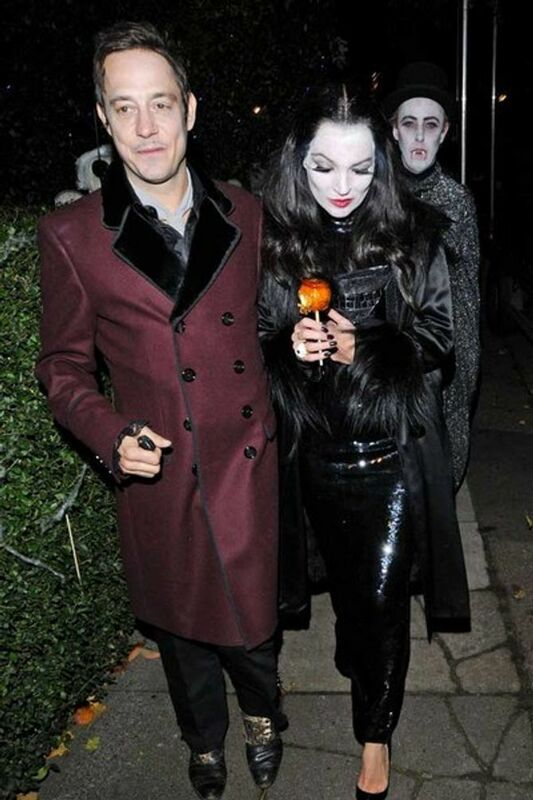 Also at the bash was Kate Moss and her rocker husband Jamie Hince, who had dressed as Morticia and Gomez Addams from The Addams Family. Kate wore a long black wig and expensive black sequin gown worthy of her status as a fashion icon, while Jamie chose a long double-breasted oxblood jacket with black velvet trim. No Doubt singer Gwen Stefani managed a more original costume, turning up to the bash with her bandmates as a zombie Sandy from Grease. She was the spitting image of Olivia Newton-John with her blonde curls, Pink Ladies’ jacket and tight black shiny trousers...except there was blood running down one side of her carefully made-up face. Jonathan Ross certainly knows how to throw a party and the raucous star-studded bash was full of celebs in scary get-up. The most imaginative outfits of the night came courtesy of comedians, with Peep Show actor David Mitchell arriving as an Elizabethan court jester, Stephen Fry was a hanged highway man, and Fresh Meat star Jack Whitehall donned a giant cockroach costume. 8 Out Of 10 Cats host Jimmy Carr looked positively terrifying as a ventriloquist dummy, and in his arms he carried a smaller, uncannily similar version of himself. This year Jonathan Ross went all out with impressive Halloween decorations and terrifying performers for his showbiz bash, transforming his Hampstead house into a haunted castle with a scary dungeon. Although the chat show host had made a big effort for the party, at the actual event his outfit was one of the more disappointing of the night as he wore a stereotypical Count Dracula costume. Next time perhaps the TV presenter could get some outfit ideas from his friends! Gwen Stefani "pregnant with third child"